It has been estimated, assuming that the average chess match has 40 moves with an average branching factor of 25, that the number of unique chess games is 10^120. More than 50% greater than the estimated number of electrons in the known universe! A chess player by the name of Macleod (a Canadian player) has the record for worst performance in a tournament. Losing 31 games in the New York double-round robin of 1889. A Cleveland, Ohio police squadron embarrassingly raided a chess tournament in 1973 under charges of gambling. They arrested the tournament directory for facilitating an illegal gambling operation. The cash prizes where confiscated as well as the “gambling devices”. The ‘Rook’ in chess is often misattributed as the source of the term rookie, a first-year professional player. Although not certain, it is believed to be derived from the the word ‘recruit’. The Gupta Empire of India originated the game of chess. It later spread to Persia after the Muslims conquered that territory. The game eventually spread next to Europe and Russia. Russia has the most grandmasters of any other country, totaling 156 GMs. Germany is second with 61 and the United States trails with 60. Chess has a very long and distinguished history. It is believed to originate out of India during the Gupta empire, and subsequently made its way to the West in the 9th century. There are 318,979,564,000 possible ways to play the first four moves of a chess game on each side of the board. 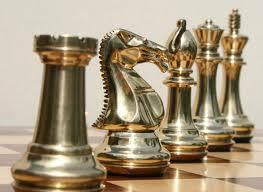 The word "Checkmate" in chess comes from the Persian phrase "Shah Mat," which means "the king is defeated". The longest chess game ever was between I.Nikolic - Arsovic, in Belgrade in 1989, which ended in 269 moves. The game was a draw. The first chess game played between space and earth was on June 9, 1970 by the Soyez-9 crew. The game ended in a draw. The folding chessboard was invented by a priest who was forbidden to play chess. The priest found a way around it by making a folding chessboard. When folded together and put on a bookshelf, it simply looks like two books. Kirk and Spock have played chess three times on the show Star Trek. Kirk won all three games. A computer called Deep Thought became the first computer to beat an international grandmaster in November 1988, Long Beach, California. Garry Kasparov, at 22, became the youngest ever world champion. Ruslan Ponomariov was younger but he was not the undisputed world champion; Maia Chiburdanidze was even younger when she won the women's title. There are 400 different possible positions after one move each. There are 72,084 different possible positions after two moves each. There are over 9 million different possible positions after three moves each. There are over 318 billion different possible positions after four moves each. The number of distinct 40-move games in chess is far greater than the number of electrons in the observable universe. The number of electrons is approximately 1079, while the number of unique chess games is 10120. Blathy, Otto (1860-1939), credited for creating the longest Chess Problem, mate in 290 moves. The number of possibilities of a Knight's tour is over 122 million. The longest official chess game lasted 269 moves (I. Nikolic - Arsovic, Belgrade 1989) and ended in a draw. The new Pawn move, advancing two squares on its first move instead of one, was first introduced in Spain in 1280. The first Chessboard with alternating light and dark squares appears in Europe in 1090.